It’s funny how as soon as our baby started on solids, all of the recipes that we made quickly became mini. I guess it goes hand in hand. Mini food for a mini person. I can’t say that I mind because I happen to LOVE making food in miniature form. 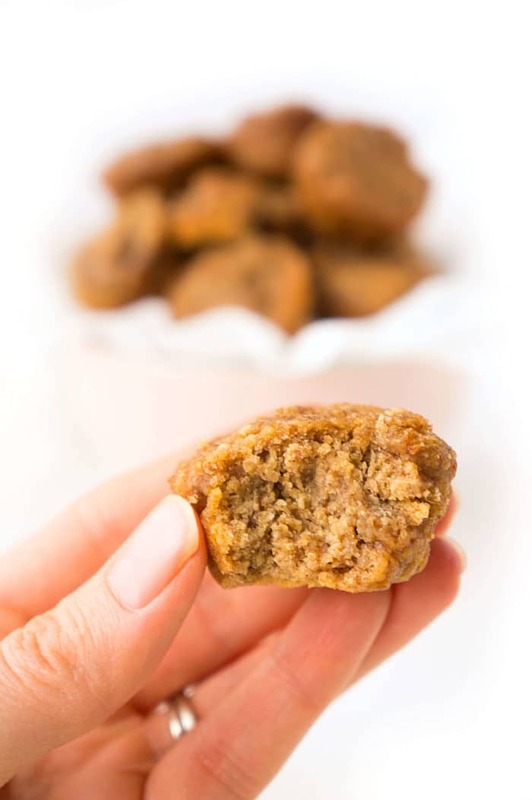 The latest miniature recipe that we made for baby were these Mini Almond Butter Muffin Bites. Perfect for little hands and mouths. Over the past 6 months or so, we’ve been giving our baby a whole variety of different foods and he’s been an amazing taste tester. For the most part, I’ve been keeping it pretty simple and mostly serving him protein and iron-rich foods like chicken, beef, and salmon, along with vegetables and fruit, whole grains and healthy fats like nut butters. 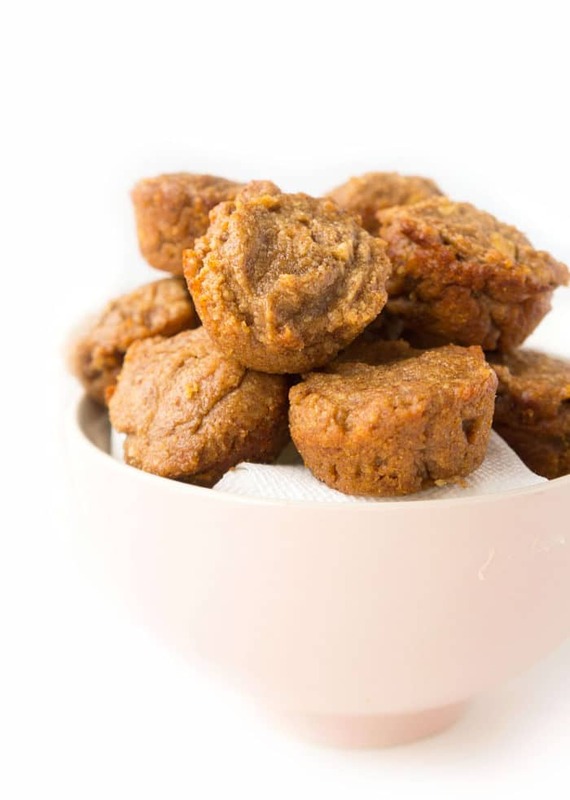 Every week, along with the foods mentioned above, I’ll make him special little bites to eat like Mini Banana Blueberry Muffins, Pumpkin Banana French Toast Sticks or Sweet Potato Lentil Tater Tots. I find it especially fun to make these recipes just to see the reaction on his face when he tries something new. When I first introduced him to the Mini Almond Butter Muffin Bites, he got a big smile on his face and proceeded to stuff the muffin into his face as fast as humanly possible. No, we don’t encourage this, but sometimes it is seriously hard to control. Anyways, I’m assuming this reaction meant that he thoroughly enjoyed the muffins. I tested them shortly after and I could totally see why he gobbled them up so fast. They were surprisingly really delicious considering there was absolutely NO ADDED SUGAR. But they were plenty sweet in my opinion. I found that they weren’t like your typical light and fluffy muffin. They were more like a dense loaf, but I tend to prefer them that way. I find they’re a lot more filling when they have a more dense consistency. So let’s talk about how to make these cute and delicious little bites. Originally, I was planning on just chopping up the dates and mixing all of the ingredients in a bowl, but then I thought about the new Ninja blender that I got for Christmas and wondered how the muffins would turn out if I blended all of the ingredients together in there. So I proceeded to dump all of the ingredients in the blender after soaking the dates in boiling water for at least 20 minutes. I’ve learned the hard way that it’s best to soak the dates before trying to blend them, otherwise it’s like trying to blend rocks, unless you happen to buy really soft dates. I don’t know about you, but I don’t want no rocks in my mini muffins! Within a matter of seconds in the Ninja, the mixture turned into a smooth thick batter. That Ninja is no joke. It definitely works some serious magic. I divided the mixture into 24 mini muffin tin cups, filling each cup about 3/4 of the way full and baked them for about 12 minutes (or until the inserted toothpick comes out clean). 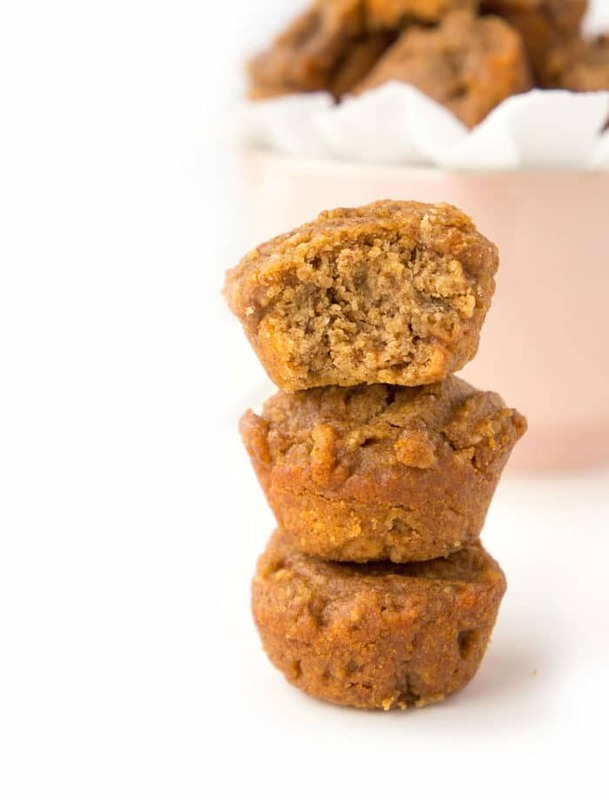 If making these mini almond butter muffin bites for babies or toddlers, I recommend using whole milk to keep the fat, calories and protein slightly higher to support their growth and development, but for adults and older children, feel free to sub in your preferred milk or milk alternative. Since the recipe makes a fairly large batch of mini muffins, I recommend freezing them if they’ve been in the fridge for more than three days as they might start to taste funky since there’s no weird ingredients or preservatives in them. That’s the beauty of these types of recipes. The ingredients are basic and in this case, very nutrient-rich. The large flake oats provide those slow-absorbing carbohydrates and fibre that can help keep blood sugar levels stable and keep you feeling full for longer. The dates are rich in magnesium, fibre and potassium and lend that natural sweet flavour, so no added sugar is necessary. The number one reason why I LOVE dates. The almond butter provides those heart-healthy fats, along with vitamin E and zinc for a stronger immune system. The milk lends some extra calcium, vitamin D, magnesium and protein for strong bones and teeth and the egg provides that extra boost of protein for lean muscle and satiety! That’s the recipe for one healthy kid. But as I said, these are not limited to kids. In fact, I HIGHLY recommend that adults eat them too to reap the benefit from all of those nutrients (and the tasty little treat, of course). Plus, they make the perfect on-the-go snack. 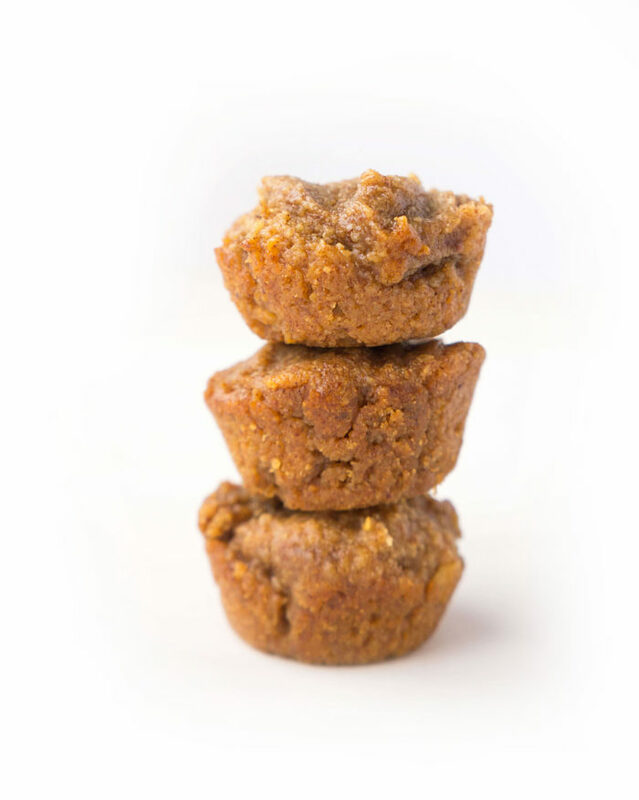 Pop them in your lunch bag, car, or gym bag and you have a ready-made snack that’s great for the whole family! Soak the dates in the boiling water for at least 20 minutes to soften. Blend ingredients for muffins in powerful blender until smooth. Spray a mini muffin the with cooking spray. 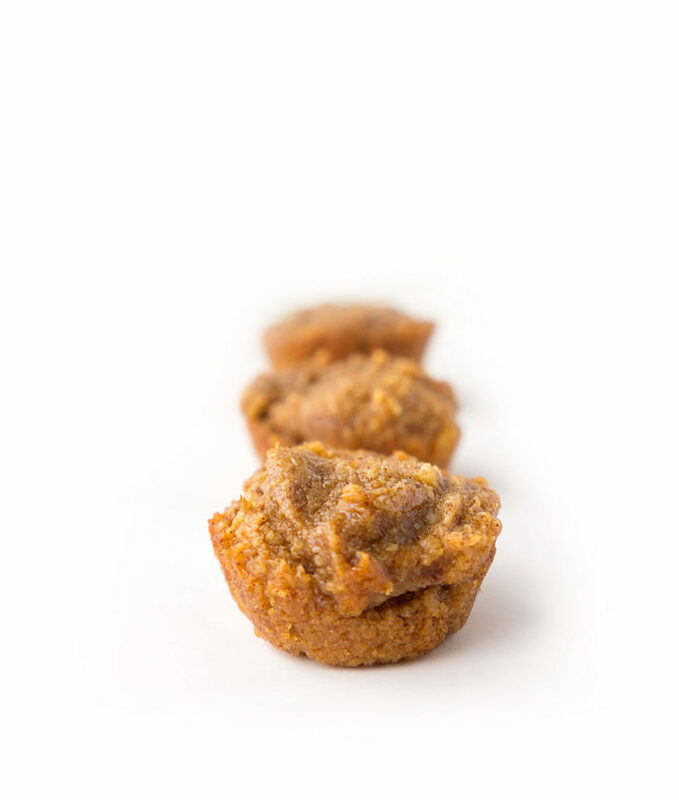 Evenly distribute mixture among 24 mini muffin cups, filling each about ¾ of the way full. Bake for 12-15 minutes or until toothpick inserted comes out clean. Store in the fridge for up to 3 days or in the freezer for a month.